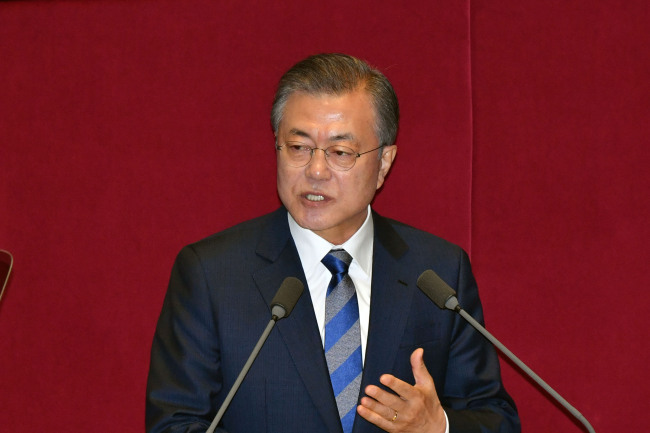 President Moon Jae-in on Thursday stressed job creation and welfare, and making peace with North Korea, promising to build an “inclusive nation” in his budget speech at the National Assembly. The government’s budget bill for next year requests 470.5 trillion won ($413.8 billion), up 9.7 percent from this year. The increase is the largest year-on-year rise seen since 2009. According to Moon, the increase reflects his administration’s drive to create jobs, support job seekers and to offer more welfare. Noting that while Korea has achieved economic growth, social and economic polarization has grown, Moon said that Korea needs to adopt a new economic development model. “Now, we need to reduce economic inequalities, and move toward a more integrated and fair society. I believe that is the path to sustainable growth,” Moon said. Saying that his administration’s income-led growth model and efforts to address unfair economic issues laid the foundations, Moon said that it would continue on the current path. Moon said that an inclusive society is one where equal social security is provided to everyone and no individual is discriminated against, and urged the National Assembly to lend its support. Under the plans, the government will set aside 23.5 trillion won, up 22 percent from this year, for job-related projects. According to Moon, the large job creation budget will be used for subsidies for companies employing young people, savings subsidies for small and medium-sized enterprises, and for creating more jobs for seniors and disabled people. The 2019 budget plans also include 20.4 trillion won earmarked for research and development projects as part of the Moon administration’s drive for “innovative growth.” Related measures include a 5.1 trillion won injection into selected fields including data-, artificial intelligence- and hydrogen economy-related projects. If wholly approved, next year’s budget will also see a massive increase in funds set aside for earned income tax credits for low income groups – from 1.2 trillion won to 3.8 trillion won. The government also hopes to offer larger child subsidies, and support measures for small merchants. If realized, the trip will be a significant step, he said, in establishing peace on the peninsula, one of his most ambitious goals. “Along with an inclusive nation, a peaceful Korean Peninsula is another axle that drives a sustainable Korea,” Moon said. Listing inter-Korean summits and military agreement, the US-North Korea summit and planned meetings between the North Korean leader and the leaders of China, Russia and the US, Moon said that a new security paradigm is taking shape. As expected, Moon’s speech drew contrasting reactions from the parties. The main opposition Liberty Korea Party strongly denounced Moon, accusing the administration of pushing a failed economic policy. “Due to the Moon administration’s income-based economic growth policy failure, the three pillars of economy; production, consumption and investment, are falling apart. And people are facing difficulties amid the employment crisis,” Rep. Yoon Young-seok, the conservative opposition’s senior spokesman said. “President Moon only held forth what parts of the economy are facing difficulties and how much tax his government will be spending (next year). He could not provide detailed plans and structural measures to boost industries such as automobiles and shipping that had once firmly supported the economy,” spokeswoman Rep. Kim Sam-hwa of Bareunmirae Party said. While agreeing with the government’s policy direction, left-leaning Party for Democracy and Peace expressed concerns as to whether the next year’s budget plan would actually alleviate polarization. It added that the government would need to provide detailed figures to prove the economic improvements. The ruling Democratic Party of Korea and progressive opposition Justice Party, on the other hand, praised Moon’s address and called for cooperative efforts of the parties at the National Assembly. “Issues regarding low growth and birth rates, aging society and polarization are structural problems that cannot be resolved short-term,” spokesman Lee Hae-sik of the ruling Democratic Party said. “We call for nonpartisan efforts so that next year’s budget plan can pass the parliament by the legal due date,” Lee said, adding a request for the parties’ approval of the ratification of the Panmunjom Declaration signed by the leaders of two Koreas on April 27.